Hans-Hubert "Berti" Vogts, started his career in his hometown club VfR Büttgen. The right-sided defender was soon picked up by one of West Germany’s top clubs at the time, Borussia Mönchengladbach, where he established himself and played for fourteen years. Nicknamed “Der Terrier” for always fighting for every ball as it was his last, Vogts was a big favourite with his home crowd. In 1967, he made his debut for West Germany and three years later he took part in his first big tournament, the World Cup in Mexico. Berti played in every game as the Germans captured bronzemedals. Vogts seldom had to settle for second best at club level. His impressive roll of honour included five league championships, one domestic cup title and two UEFA Cup titles all with the same club, Borussia Mönchengladbach. On a personal note, he was named German Player of the Year twice. One trophy that eluded him was the European Cup which he came very close of winning in 1977 when his team lost 3-1 to Liverpool in the final in Rome. By then he was already a World Cup winner. 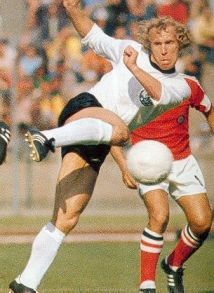 Three years earlier, West Germany hosted and won the World Cup with Vogts as one of their most important players. He played in all the seven matches including the final where he was marking the Dutch star Johann Cruyff with success. 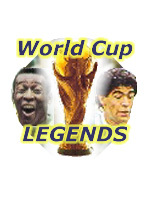 He was infact an ever-present in every of the three World Cups he participated in, making his total of games to 19, beaten by only five other players in World Cup history. In 1977, Berti took over the captaincy of the national team from Franz Beckenbauer and kept it until after the Argentina World Cup the following year which was no success for him or the team as West Germany bowed out in the second phase. He retired as a player in 1979 and started working as a scout before taking over the German national team as coach in 1990 leading them to victory in Euro 1996.